David Cronin: Why is Ireland's prime minister tagging the Israel lobby on Facebook? Why is Ireland's prime minister tagging the Israel lobby on Facebook? Leo Varadkar, the Irish prime minister, is regularly seen attending rock concerts or modeling novelty socks as he attempts to cultivate an image of being hip and humorous. A recent inquiry made by Varadkar via Facebook about whether he resembled the cartoon character on his coffee mug appeared at first glance to be another example of such contrived lightheartedness. For some reason, though, Varadkar had “tagged” one person in his post. That person, Barry Williams, happens to be Ireland’s most ardent supporter of Israel. The taoiseach – as Ireland’s prime minister is called – offered no explanation about why the note was addressed to Williams, who runs the group Irish4Israel. And multiple requests for comment to Varadkar and his office went unanswered. Why the silence? The Irish public is broadly sympathetic to the Palestinians’ plight. Any connections that Varadkar has to Williams and Irish4Israel are, therefore, matters of public interest. If they are simply friends, that is not problematic as such. But if Williams is using that friendship to lobby on behalf of a foreign government – Israel – then the public has a right to know about it. Varadkar has previously displayed greater sympathy towards Israel than most other politicians in the south of Ireland. EU diplomats recently credited this “open skies” agreement with facilitating a surge of visits to Israel by tourists from certain European countries. Varadkar appeared to distance himself from Ireland’s small pro-Israel lobby while Gaza was under attack the following year. In a tweet, he denied belonging to a “friends of Israel” group within the Oireachtas. But Varadkar has never formally retracted his earlier declarations of support for Israel. And the need for transparency about where he stands is all the more pressing now that Varadkar is taoiseach. Israel has made clear that it wishes to change what Benjamin Netanyahu, its prime minister, has called Ireland’s “traditional stance” of supporting Palestinians. Netanyahu was exaggerating the extent of elite support for the Palestinians. Like all other EU governments, Ireland has been hugely accommodating to Israel for a couple of decades at least. Netanyahu nonetheless wants Ireland to go further. For example, he wants organizations that campaign against Israel’s human rights abuses to be denied financial assistance. The agenda pursued by Irish4Israel is strongly in line with Netanyahu’s stance. The group frequently tries to portray Palestine solidarity campaigners as extreme and unreasonable. Aggressive tactics of that nature are unlikely to win Irish4Israel too many friends among the public. But if the group has the prime minister onside, perhaps it feels emboldened. That’s all the more reason why Varadkar must end the mystery surrounding his mug. •First published by The Electronic Intifada, 15 November 2017. 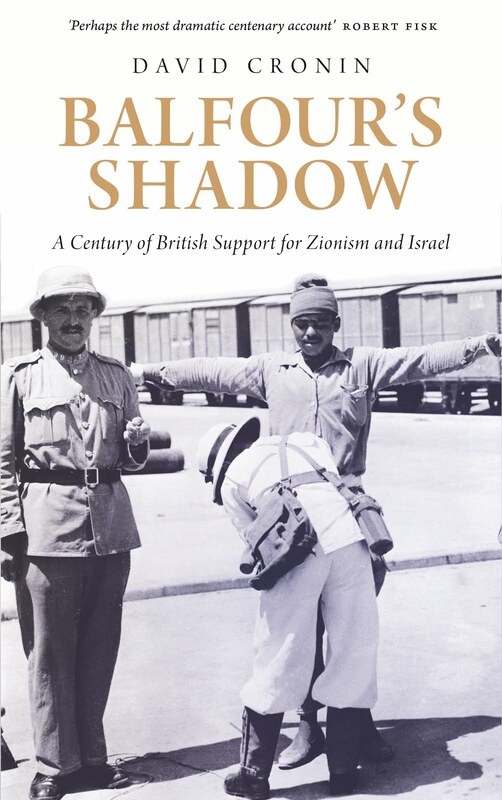 Why is Britain proud of the Balfour Declaration?